We can’t deny the fact that technology has transformed the way we live, from how we communicate and share information to how we navigate through our daily activities. In other words, we’re glued to our devices and it’s taking a toll on our bodies. Chances are you’re looking down at your device to read this article — head forward, shoulders rounded and back slumped, now known as ‘text neck.’ As the upper back rounds, the head and neck start to jut forward and out of alignment from your spine. No wonder your body hurts. This graph shows the effects of the tilt that accompanies smartphone use. 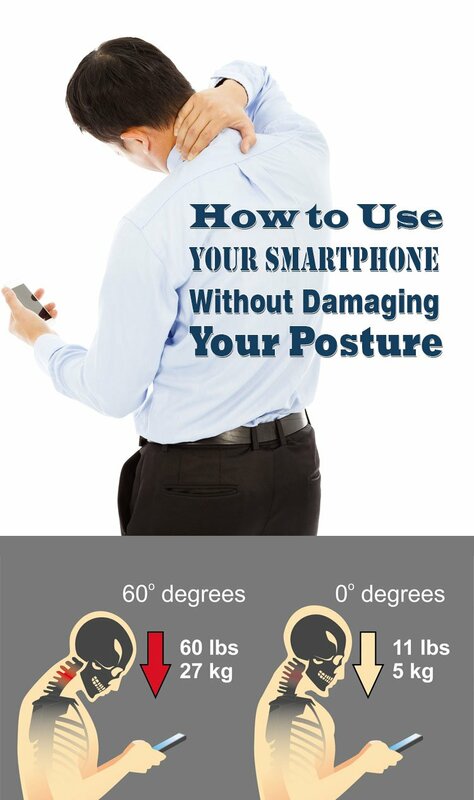 Most people when using a smartphone while standing assume a neck position between 45 and 60 degrees. That means we go from putting the normal 10-12 pounds of weight on our necks to a massive 49 to 60 pounds! 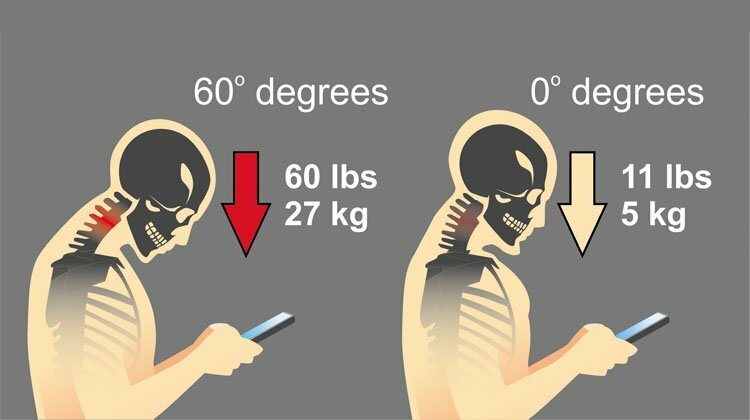 When we add that we spend on average 2 to 4 hours with our heads tilted over reading and texting on our smartphones, that accumulates to 700 to 1,400 hours per year of excess stress placed on the cervical spine. To make matters even worse, students are spending an extra 5,000 hours bent over reading, texting, and typing on their devices! The following are some simple and easy tips for eliminating the smart phone slump and avoiding these negative side effects. Assuming the correct posture all the time can lead to an increase in productivity at work and a higher resistance to stress. Every time you use a smartphone, remember that a correct posture NOW can help you avoid many health issues in the FUTURE. Of course, using our series of exercises specifically designed to tackle bad posture and back problems will further help your journey towards a healthy neck and spine. Enjoy and please share if you find our posts helpful. Thank you!